Top row, left and center: John Sahag and his models in his first Workshop, photographed by Lawrence Ivy for a Anthony Haden-Guest article in New York Magazine, 1986. Top right: Jaclyn Smith, John Sahag, Brooke Shields, at the Palladium, 1986, photographed by Kevin Mazur, London Features Int. 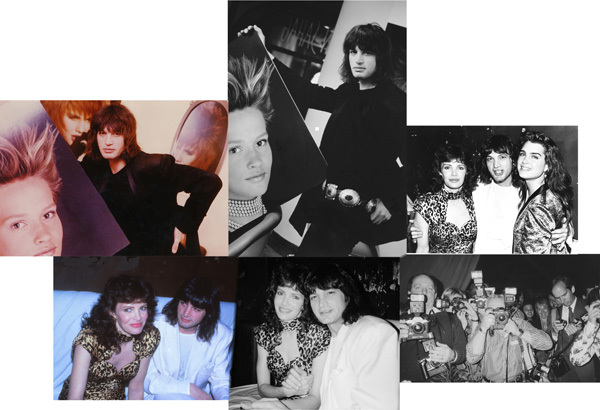 (USA) Ltd.
Bottom left and center: John Sahag with Jaclyn Smith, who hosted a party for him at The Palladium, 1986. Color photo by John Barrett, black and white photo by Patrick McMallum. Bottom right: NY’s top paparazzi photographing John, Jaclyn and Brooke. And there’s me in the center, beaming. Photo by John Sahag. Here is John Sahag in a video thanking editors for an award he couldn’t accept personally because he would be in Paris working on an Issey Miyake show at the same time as the ceremony. Video by Vidcat Productions, 1997. Claudio. Thank you so much for your post, from the heart. So happy John and his work are alive for you. And most impressed you are going to make a series of seminars with a tribute to John. Good to hear from you, Bruce. Been a long time. Yes, we were all part of something special. Thank you for the thank you. Wow! Very exciting to see and hear his voice again after all these years. I am amazed at how much I miss him. I owe him so much for all he taught me about hair and life. It was wonderful working with him in his first salon. I felt I was part of something really special. I have never felt like that about any salon since. Thank You Helen for all of your work and dedication. For all of you that don’t know me I am John Sahag’s second cousin from Sydney, Australia. First of all thank you Helen for your wonderfull contribution to John’s work, without people like you his memory will not live on. I did not know John for that long, for it was when I was 4 years old I met him. I always wanted to see him again but sadly he had passed away when I had visited his Workshop in NYC. For nearly a decade I have researched his work online (I think I am his only relative who has researched him more than anyone) and was amazed at how successful John became that I not only wanted to know about him but also the people he worked with. I hope his spirit touches me so that I can meet more people who have shaped his life and get to know about John more. John did not only make a difference in the industry but a difference in everyone’s life around him, and that’s what people will never forget. R.I.P cuz :) you will not be forgotten. Very beautiful, Shant. Thank you. What an amazing individual. How thrilling (and exhausting) it must have been to work with him. Love the video clip. Thrilling and exhausting. I was working 14 hour days! Yes, I love the video too!